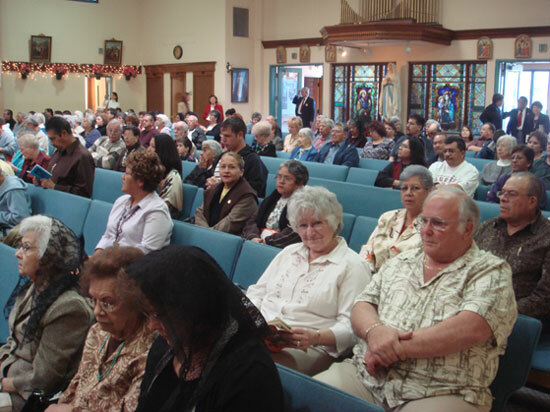 Parishioners at church on January 3rd 2009. People are preparing for Mass. Part of the high altar and the old pulpit were used on the 150th Anniversary Mass. Old banner of the Third Order of Franciscans. Smile, here comes Father Ricardo with his camera! The Catholic Daughters of America were present in this celebration. Many items of the old church were incorporated in this celebratory Mass. Bishop Ricardo Ramirez presided in our special Mass to mark the beginning of our 150th Anniversary. Bishop Ramirez during the Eucharistic Prayer. Here comes Father Ricardo again with his camera. Celebrating our saint: St. Genevieve of Paris.